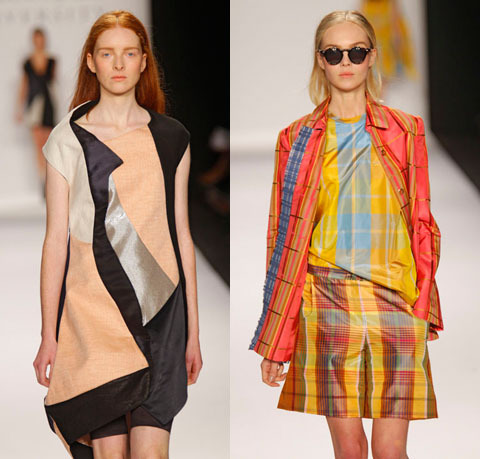 Pieces from Jie Pan (left) and Brittney Major’s collection shown at New York Fashion Week Spring 2010. Debut, the New York store that is a haven for up and coming designers, has chosen not one – but two – of our alums to sell their collections that they showed in September. Brittney Major won Debut New York’s inaugural Designer Open Call that they had earlier this year and to make matters better, the store decided to include Jie Pan’s collection into the mix as well. In the upcoming year, Lisa Weiss (founder and owner of Debut New York) will grace the racks of her store with Brittney’s plaid-happy unconventional preppy collection and Jie’s mystical Anna Fidler pieces. For more info on Debut New York, visit their website.